▪ The desktop ionizing blower produces an airflow that is rich in positive and negative ions. Directing the airflow on an object that has a static electricity charge will neutralize the charge. 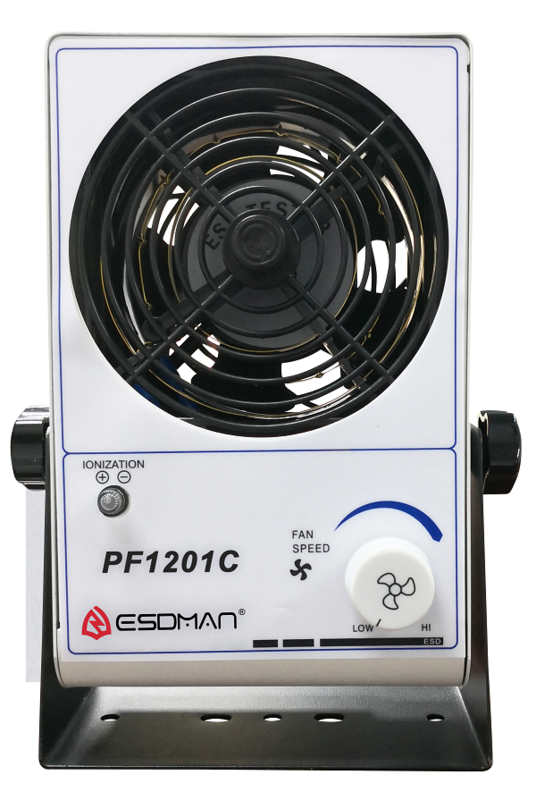 ▪ PF1201C is a portable ionized air blower. It uses a small fan to produce airflow. The volume of airflow is controlled by a variable speed control, which provides a wide range of airflow setting. The high voltage AC is applied to a circular arrangement of tungsten steel ion emitter points, which results in an intense alternating electric field at the tip of the emitter points. It is this electric field that creates alternating polarity ions in the airflow. To assure that the unit is working properly, the high voltage AC is monitored by an ionization indicator lamp. ▪ PF1201C features a patented balancing circuit. Also features a patented built-in emitter point clear. Using the point clear takes only seconds. Cleaning the emitter points on a weekly basis prevents the build-up of airborne debris all electrical ionizers are prone to. This keeps your blower working in top form for the life of the unit. ▪ Distance measured in mm, decay time measured in seconds. ▪ Test data available using ME 268A charges plate analyzer. ▪ Test figures are subject to the variation in the atmospheric conditions. ▪ Discharge times are in seconds from 1000 volts to 100 volts. To clean ion emitter points: simply rotate point cleaner knob located at center of each outlet clockwise to the stop (approximately one turn) and release. The spring-loaded point cleaning brush will return to its home position. The air inlet grilles on the top of the unit and ionized air outlets should remain clean to prevent restriction of airflow. They can be cleaned with a soft brush or vacuum. Use a charged plate monitor to test the unit for ion output. Discharge times should be measured and checked. 1.In a charged plate monitor is not available, but a hand held electrostatic field meter is available, ion output may be checked using the following procedure. ▪ Take a piece of plastic and rub it with cloth until a static charge can be read with the static meter. ▪ Turn on the PF1201C unit and set fan speed to high. ▪ Hold the plastic 1-foot away from center ionized air outlet for five seconds. ▪ Remove plastic from ionized air stream and measure static charge. The plastic should be neutralized. 2.If no instrumentation is available, ion output may be verified with the following procedure. ▪ Tear-off about a 300mm length of Scotch brand (or equivalent) transparent tape. ▪ Approach non-adhesive side of tape with you free hand and note the electrostatic attraction of tape to your hand. ▪ Pass tape through the ionized air stream approximately 1 foot from unit and again approach non-adhesive side of tape with your free hand. If the tape has been neutralized, it will not attract. ▪ Use a charged plate monitor to test unit for ion balance of +/- 10v. ▪ Do not try to determine ion balance by holding a static meter in the ionized air stream as this will result in a meaningless reading. ▪ Do not insert objects through intake or outlet grille. ▪ Do not try to verify operation of unit by drawing a spark from an ion emitter point. The design of the balancing circuit makes the “spark test” inconclusive. Sustained grounding of ion emitters may damage balancing circuit. We strictly pursue the policy of high quality, high reputation, and customers are paramount. Guarantee is due for one year from date of purchase. During this period any quality problem caused by product parts, materials are under warranty. Replacement parts and material are charged to customer after warranty expired. Labor cost for repairing is free.